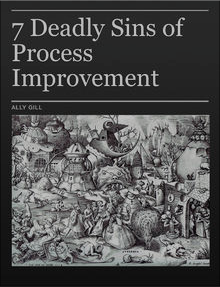 So 7 Deadly Sins of Process Improvement is now freely available on the iBooks Store in 51 countries. You do need a Mac or an iPad to be able to download and read this version, but I am working on creating it in other formats for non-Apple users. For now though, I am happy to send out a PDF version if you send me your email address. Drop me an email at ally@allygill.co.uk with the subject "7DS Book" and I'll send you a copy within 24 hours. I will update the publication in the future and "subscribers" will automatically get the new version.